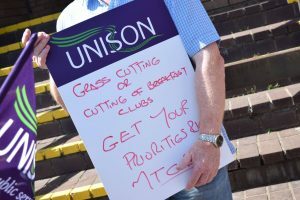 On 6th June the Joint Trade Unions in Merthyr Tydfil Borough Council lobbied a meeting of the council to try to persuade them to not go through with plans to make cuts in the provision of Breakfast Clubs for children in Merthyr. The lobby was attended by workers, kids, parents and trade unionists. It was colourful and upbeat. 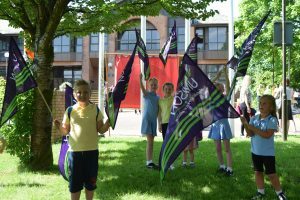 UNISON Regional Organiser Steve Belcher said: “This lobby of the Council demonstrated very clearly the depth of anger that is felt across the Merthyr area against the Independent Groups proposals on School Breakfast Clubs”. “UNISON members do not just deliver the service they also access it themselves. If MTCBC impose these changes it will absolutely devastate what is a very successful service”. “The Independent Group are proposing massive cuts in hours and salaries for our members. 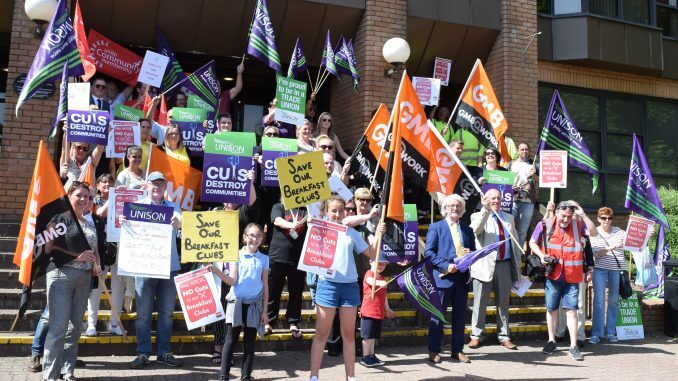 Many Breakfast Club staff have told us that if their hours and salaries are cut by up to 50% it will be impossible to maintain the first class service that so many parents and children rely on”. The public gallery was packed throughout the debate and the meeting decided to defer its decision to the next full meeting of the council.